A new history of 19th-century America captures how the United States was always an empire. 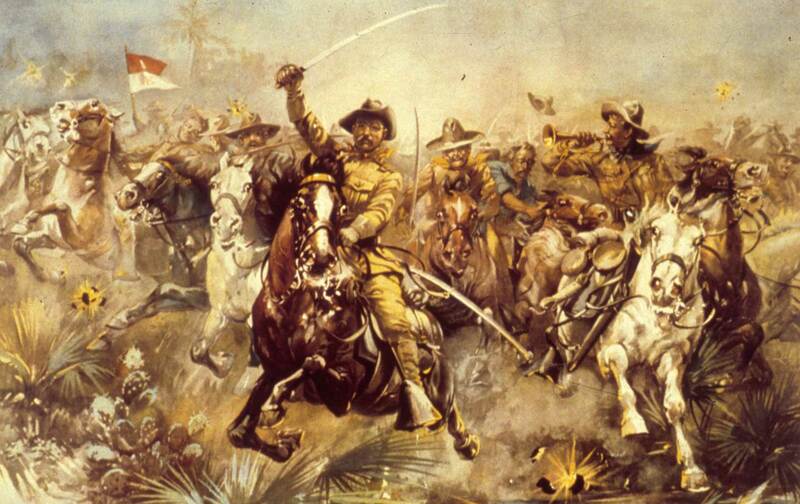 Teddy Roosevelt leading his Rough Riders at the Battle of San Juan Hill, July 1, 1898, as depicted by W.G. Read. “A nation without borders,” Donald Trump declared on the campaign trail, “is not a nation at all.” Don’t react too quickly—there is at least some historical truth to that statement. The nation—more precisely, the nation-state—is nothing if not a system of boundaries. In this country, it arose in the middle of the 19th century, powered by the revolutionary advance of industrial capitalism as it moved across Europe and the Atlantic and on to American soil. Like its contemporaries around the world—Bismarck’s Prussia, say, or Qing China—the ascending American nation-state never really had precise boundaries and it faced a vast array of local and foreign challenges to its authority. Likewise, its expansion never seemed to end. What was first an open-ended settler confederation on the imperial fringe became an enclosed nation-state, which then transformed into an unbounded empire. The process through which the American nation-state emerged and then grew into an empire is the subject of A Nation Without Borders, a compendious new work on America’s 19th century by New York University historian Steven Hahn. The third entry in the Penguin History of the United States, A Nation Without Borders takes us from the Jacksonian dawn of American “democracy” to the First World War. Hahn reminds us that our little postcolonial republic had imperial inclinations even at its birth. From its outset, the country was seeking to seize new lands and resources as well as to consolidate those territories it had already absorbed. That America’s economic and political origins can be found in its imperial expansion—first within the American continent and then abroad—is well-­established. But Hahn manages to do something new by showing how the Civil War and the struggle to abolish slavery from this country fits into this narrative as well. The conceptual heart of Hahn’s new history is an argument that the nation-state has never been a stable political form that is distinct from empires. It has always emerged out of and then sustained itself on the imperial conquest of new territories. Just as the 19th-century European nation-states had to plunder and exploit the “third world” to quell various social upheavals at home, so too has the American nation-state needed to go hunting abroad in search of natural resources, new markets, and cheaper labor. The irony, of course, is that the triumph of American empire outside the country’s borders has also meant the weakening of the American nation-state within them. Once a critical instrument in marking off American territory, defining its citizens’ identity, and enabling economic growth, the success of American empire has created all sorts of domestic uncertainties and calamities. American identity, sovereignty, and democratic control—especially over the economy—all began to dissolve just as the United States came to dominate the rest of the world. While international imperium and the formation of the American nation-state once ran together, it is now clear that they also have the capacity to tear each other apart. Hahn’s expert history offers us a reminder that this was true in the 19th century as well. That Trump’s campaign-trail observation mirrors the book’s title is not a coincidence. The contradictions of American imperialism abroad and nation-state building at home have been with our country from the start, even if they have now boiled to the surface. A Nation Without Borders begins in northern Mexico, where the vast and thinly peopled deserts and prairies on both sides of the Rio Grande formed a crossway of empires. From the south stretched the grasp of the new Mexican state, racked by postrevolutionary strife and scarcely able to enforce its legal claim on far-flung territory. Reaching from the east were the increasingly aggressive American slave drivers, hungry for the new cotton lands of Texas and whatever else might be grabbed. And from the north and west thundered the horseback power of the Comanche, arguably the true rulers of the southern plains in the early 19th century. Classical sovereignty—the territorially delimited monopoly on force—was not much in evidence in this area, even after Texas declared itself an independent republic from Mexico in 1836. Comanche raiders ranged freely across the land, taking captives, goods, and horses. The local population consisted in large part of Anglo plantation owners and their slaves, and the plantations formed states within a state, where semi-sovereign owners wielded violent power by dint of race and property. Likewise it wasn’t always clear who really was in control of the state. The United States, at the time, was considering a potential annexation of the republic, and to make matters worse, the British turned up on the scene after Texas declared independence, hoping to block American expansion and secure a cotton supply while they were at it. Hahn opens with the story of Texas’s strange halfway house of nationhood in order to highlight an idea that he returns to again and again. As the nation-state began to take form in the early 19th century, sovereignty—that is, who is ultimately in control—was often hard to locate. Across the South, plantation masters reacted to the abolition of slavery in Haiti and in much of the North with a redoubled militancy that often posed a direct challenge to the American state. Paramilitary and vigilante police forces emerged throughout the country, particularly in the South, constituting local pockets of semi-sovereign political authority; and ideas like secession and nullification were in the air. In the North, too, there was a wide distribution of political sovereignty. Small farms governed by yeoman patriarchs dominated the countryside. They participated gingerly in the market, but they didn’t depend on commerce for what they needed to survive and ruled their family farms as tiny fiefdoms. In the cities and mill towns, authority was similarly dispersed. Industrialization had begun, but in a haphazard fashion. Corporations were mainly unheard of. Manufacturing took place on a small scale, in workshops headed by master craftsmen. The first significant labor movements in America appeared in these years, organized by apprentices who sensed their shrinking chances of becoming master craftsmen themselves and who began to challenge the traditional centers of economic power. The money economy didn’t reach deep into American society, and the urban bourgeoisie couldn’t form in such shallow waters. Rather, the great landowners and merchants who “controlled the wharves, the shipping, and the warehouses, extended loans,” and “owned the most fertile and well-situated lands” formed the ruling class. As Hahn explains. “The dynamism was to be found in the circulation of goods and people, at times over great distances, rather than in major transformations in the way the goods were produced or the people deployed.” He names this antebellum dynamism “market intensification.” The wheels of commerce spun faster, but the basic pattern of society didn’t change as it would later on. The only way to accommodate the ensuing demographic and economic growth within the existing social structure was to spill westward, seizing territory from native people and the Mexican state. As is well known, this expansionary dynamic led to a political crisis. It did so by scattering across the country a vast archipelago of sub-sovereignties within US territory: Planters set up vast cotton plantations in the Deep South and Old Southwest; yeoman farmers spread across the upper Midwest; Mormons set up Utah as an isolated theocracy; Native Americans still dominated the plains; settlers fought vicious border wars in “Bleeding Kansas,” and miners did the same in Gold Rush California. The rival ruling classes of the North and South each sought to impose their own order on this chaos. The newly conquered territories in the western half of the United States served as an outlet for the accelerating pressure of market capitalism, and for this reason, these territories were hotly contested. Compromise would only last so long; eventually, one labor system and one area of the country would become dominant. Lincoln’s Democratic Party rival Stephen Douglas presciently accused the future president of seeking to impose “uniformity among the institutions of the different states.” Douglas, on the other hand, spoke for “the principle of diversity in local institutions and laws.” Douglas wanted to preserve the heterogeneity of political and economic power. At the center of the 1860 election was thus not only the question of slavery but a struggle to redefine sovereignty. The scope of federal power, as neo-Confederates have long claimed, was indeed a critical spur to Southern secession—not because of slavery’s irrelevance to the secessionist project, but precisely because the question of slavery was at one with the question of political authority. Hahn is at his best on the years of war and reconstruction. Drawing on his Pulitzer Prize–winning 2003 book A Nation Under Our Feet, he rightly treats the solidarity of the slaves— a nation within a nation if ever there was one—as the central engine of the revolution of the 1860s that remade the balance of political and economic power. He quotes William Webb, a slave and organizer of resistance, who foresaw “a great light coming. And it will be here sooner than we expect.” The war, of course, proved him right. The war marked what Hahn calls, not without irony, the “birth of a nation.” The exigencies of the brutal struggle called forth an astonishing new degree of federal power in the North. Some examples are famous: the establishment of the land-grant colleges; the opening of the West to homesteaders and the transcontinental railroad, accompanied by a new phase of aggressive warfare against indigenous people; conscription, enforced in the military suppression of the New York draft riots; the income tax. Others are less well-known, but at least as significant. In particular, the financing of the war effort proved of lasting significance. Rather than establish a central bank, Lincoln’s administration sold securities on the domestic market. This approach created a new stratum of finance capitalists, and in so doing begot the first consolidated American ruling class—centered in New York, based in finance capital, in alliance with the Republican Party. The same set of questions was called on the Confederate government but, as historian Stephanie McCurry has shown (and Hahn retells), the dynamic that was generative in the North proved destructive in the South. To prosecute the war, the new Confederate nation—founded on the principles of decentralization and plantation sovereignty—had to attempt the same kinds of state-building efforts it had rebelled against. The classic case was the failure of the South to arm the slaves—imperative for the survival of the Confederate state, but unthinkable for the slave drivers who were its principal constituents. The Confederacy thus failed to produce anything like the nation-state built up in the North, and it foundered amid Northern invasion and slave unrest. The defeat of Southern rebellion thus brought not restoration but revolution. Freed people had begun to assert their rights to the land they had worked and to citizenship in the nation they had struggled to defend. “We called upon them in the day of our trial, when volunteering had ceased, when the draft was a partial failure,” recalled a Union colonel. “They were equal to the crisis.” And so, under the threat of federal force (Union troops stayed in the South until 1877), they became equals. The creation of a new nation—one organized around a federal state—meant the creation of new citizens. Reconstruction brought the most dramatic instance in American history of the revolutionary experience of a world turned upside down. Although Andrew Johnson, a Jacksonian Democrat après la lettre, attempted to obstruct the egalitarian agenda of Reconstruction—blocking civil-rights bills as “strides towards centralization”—­black determination on the ground combined with the Radical Republicans’ ascendancy in Congress to overrule him. The central government, after years of challenges to its sovereignty, was now able to assert its power. The Reconstruction amendments to the Constitution, the legal capstone of the emerging nation-state-building project, imposed the protections of citizenship evenly on all states. Freed people in huge numbers joined the Union League, the organizing wing of the Republican Party in the South. The US Army conducted a massive voter- registration drive, and between 80 and 90 percent of Southern black men enrolled. “Black voters now composed a substantial portion, if not a majority, of the total electorate in the rebellious states,” Hahn writes. Across the South, African Americans took local and, occasionally, statewide political power. Black legislators funded schools, and black sheriffs protected constituents from lawless white violence. W.E.B. Du Bois described the situation in South Carolina, where black political power reached its zenith, as showing tendencies toward a “dictatorship of the proletariat.” Describing Reconstruction in Louisiana, Hahn makes a similar point, comparing the moment, in its revolutionary import and brutal defeat, to the Paris Commune. Nation-states, Hahn reminds us, differ from empires in how they “define themselves in relation to constellations of values.” Empires dominate and extract. The people they rule are not subjects of the nation; conquered Sioux were not Americans until the country forced them through a political and cultural mill to make them so. Filipinos, for example, would be subjugated without ever becoming Americans. Nation-states, unlike empires, establish “ideas of citizenship and belonging that undermine previously existing forms of personal and group sovereignties. They champion a ‘rule of law’ that stands as an alternative to the long-prevailing rough justice of local communities” and compel their subjects to embrace “the modern and proper way of doing things.” Nation-states form communities, beloved or not, and produce national subjects—in this case, Americans. With the country successfully reconstructed and under the leadership of a nationalist political coalition, the obstructions that had impeded the rule of capital before the war fell. The postbellum decades saw railroad tracks laid across the country, great factories and corporations rise in the cities of the North, and vast streams of immigrants come to work there. The nation-state, finally fully realized, immediately looked outward: to Alaska, Hawaii, the Caribbean, and beyond. The mechanisms that allowed the United States to colonize a vast stretch of its own continent and to consolidate power over its territories were now pointed toward those lands outside its dominion. Hahn concludes his book with the most explicit intersection between the emerging American nation-state and its increasingly pronounced and explicit forms of imperialism: the emergence of figures like Teddy Roosevelt, who sought to build a consolidated “progressive” state at home and spread American power abroad to the Philippines, Cuba, and Puerto Rico. The coincidence of global imperialism and domestic Progressivism provides Hahn with his resolution. He ends his book with the American state at the doorstep of global rule, only just beginning to shift its energies away from colonizing its own continent. “Every argument that can be made for the Filipinos could be made for the Apaches,” explained Teddy Roosevelt. “Every word that can be said of Aguinaldo could be said for Sitting Bull.” America’s overseas empire was intended to complement and secure the domestic nation-state, not stretch it into some distended global form. By the turn of the century, a new articulation of nation and empire had thus begun to develop—a new sense of where boundaries fell, and who was inside and outside of them. A national community, self-contained, had finally come into existence. This new nation-­state depended on both a domestic “exterior” of subjugated and second-class citizens—the disenfranchised racial other, black America—and the creation of an “interior” abroad, through the economic and military subjugation of a growing part of the world. This set of tensions—between insides and outsides, inclusions and exclusions, citizens and subjects—are, Hahn reminds us, the central political contradictions of global capitalism. “Ideals of nationalism, anticolonialism, and social democracy mixed in a most explosive way,” he concludes. Hahn, of course, is writing about the American 19th century, but much the same could be said of the political crisis that has gripped much of the world over the past decade: The same tensions that accompanied the rise of the nation-state have reemerged with its decline. A Nation Without Borders answers the question that social history was asked a generation ago: What larger picture of American society can we derive from a thousand local historical studies of colonization, enslavement, industrialization, and immigration? Hahn has shown the insight that comes from synthesizing these local studies into a sweeping narrative of the 19th century. He has taken into account the revisions of younger scholars in the intervening years and given us, above all, a truly political history. While A Nation Without Borders locates the most profound forces of historical change in political economy and traces their mediation through society and culture, it also insists that historical contradictions can only be resolved through expressly political forms of confrontation. Economics and history’s propulsive force are not enough. Without struggle, there can be no progress. That capitalism’s tensions play out in full force not only in economic crisis but in political life helps us better understand our own moment: an era in America’s history in which the denationalization of capitalism over the past four decades and the accelerated mobility of capital, goods, labor, and people, the problem of sovereignty has created all sorts of social and political crises. Mass incarceration and free-trade zones, immigrant-detention centers and global financial markets, a lost sense of control coupled with a growing concentration of economic and political power in the hands of the few—these are the contours of the worsening crisis of sovereignty that is being experienced in much of the North Atlantic. What we face in the United States is not, as is often remarked, imperial decline; it is the decline of the nation-state that has emerged alongside and co-existed with two centuries of American empire. As a result, many on the right and left have turned to more local forms of political organization to provide shells for resistance. On the right, these new movements have often come in truculent and hateful expressions: the Birthers who called into question the citizenship of our country’s first black president; the emergence of “tea parties” protesting federal regulations and social protections; and as of late the resurgence of white supremacy and the openly xenophobic and misogynist campaign rhetoric of Donald Trump. On the left, there have been more positive and productive forms of protest. The Occupy Wall Street movement emerged in 2011 to call into question the ways in which financial and political power was concentrated in the hands of the few. With Trump’s ascendence, sanctuary campuses and cities have become a common rallying point—a demand for local defiance of national authority. The struggle at Standing Rock also offered an acute example of how a local body of people can generate, through concerted action, the right to determine their own fate. We cannot borrow any answer to the question of sovereignty wholesale from the 19th century. But we can place ourselves in the historical period Hahn examines in his book and begin to see what is going wrong. By understanding the rise of the nation-state and its operative contradictions, we also can get a sense of the immense task that lies before us. No return to the bounded nation-state is possible today. To assert democratic control over capital will require a politics that works on an international scale. Although the visions of egalitarian internationalism that dominated the mid-19th century were utopian even in their formation, our task is no smaller today than it was back then. And there are far worse examples to invoke than the activism of the antislavery movement, which serves as the central hinge of Hahn’s narrative. The abolitionists imagined a new order of things that was at once cosmopolitan and local. They made use of bastions of support in the North before the war to shelter runaway slaves and undermined federal law when need be. They sabotaged the South from within and organized politically, managing to get partial hold of a major party. They fought bitterly with its establishment. They were often on the margins. And they turned the world upside down. Gabriel WinantGabriel Winant is a historian living in Cambridge, Massachusetts. He is writing a book about care work and the Rust Belt.